Even though the Multivision model FG-1000 didn’t sell well upon its 1983 release, Tsukuda Original still saw fit to release the FG-2000 in 1984. The newer model had blue keys instead of red, an additional controller input, and a D-pad in place of the joystick, but was otherwise the same. 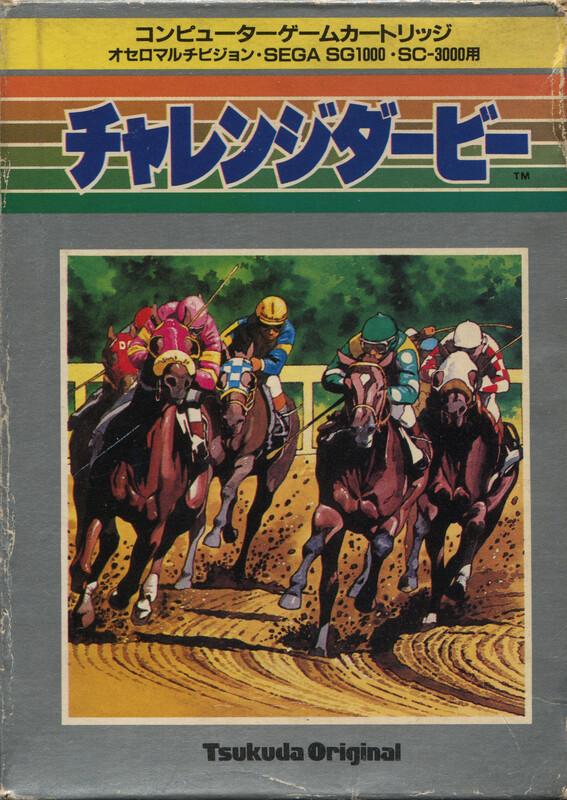 Five additional Multivision-branded games were released in 1984, as well: Sannin Mahjong (sometimes referred to as 3-jin Mahjong), Challenge Derby, Okamato Ayako no Match Play Golf, Space Armor, and 007 James Bond. By 1985, in light of continued poor sales and Sega’s decision to focus attention on the Mark III, Tsukuda Original abandoned the Multivision to the four winds of destiny: Amazon, eBay, retro game stores in Japan, and the trash. Today, the system remains incredibly hard to find, and is a finger-wagging reminder of why companies shouldn’t make a clone of a system that isn’t selling well. To learn more about the Multivision, click here. Otherwise, on to the games! Tiles, tiles everywhere, so let’s all waste our money. In it to… win it? Remember the time I reviewed Mahjong? How about Home Mahjong? Of course you remember those sparkling wells of excitement! Two mahjong games should be plenty for a short-lived console like the SG-1000, right? Well, here’s Sannin Mahjong to prove you mah-wrong. 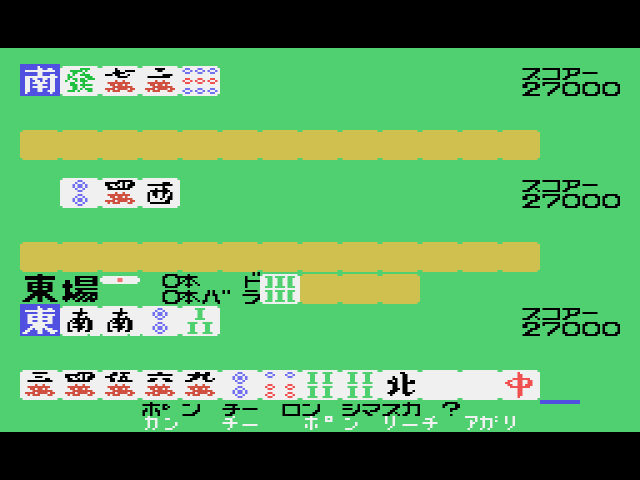 “San nin” means “three people” in Japanese, and indeed, every match is a battle between two computer opponents in the quest for mahjong glory. Three-player mahjong is apparently quite different from four-player or two-player mahjong, but I couldn’t tell from my time with this game. I’ll admit, there’s a good chance I was playing incorrectly because I didn’t take the time to learn the subtleties of three-player mahjong. 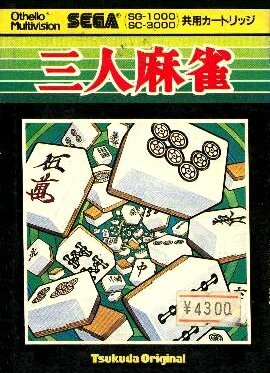 Based solely on my lacking Western perspective, though, Sannin Mahjong looked and played just like the others, sans the sparkle. Just like riding a merry-go-round. Go, little fruit snacks! Go! Challenge Derby celebrates the exciting world of horse race betting. 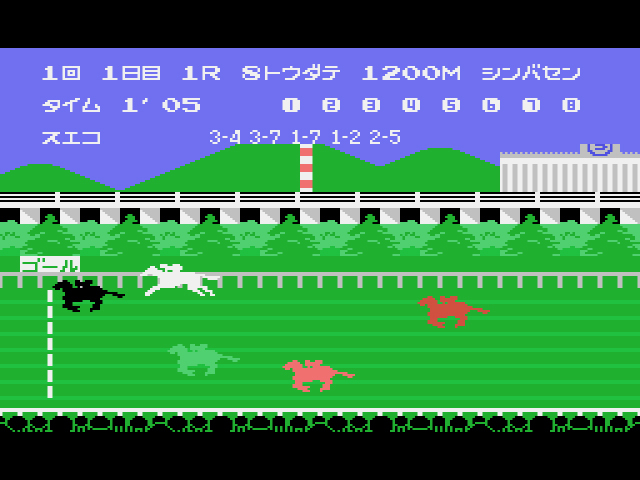 Up to eight people can bet extravagant amounts of yen on the horses by passing the unwieldy Multivision console back and forth (don’t forget, the controller is built in to the console). When the races begin, watch in amazement as the multi-colored stallions race to the finish line. Watch hard, because you can’t actually control the horses. At least in Challenge Derby, horse racing is a purely spectator sport. If you’re not yelling at jockies while wearing a floppy fisherman’s hat, gray and brown clothes, and a five o’clock shadow, you’re not spectating properly. I’m with the bird on this one. You may not know who Ayako Okamoto is, but rest assured, she’s better than you at golf. 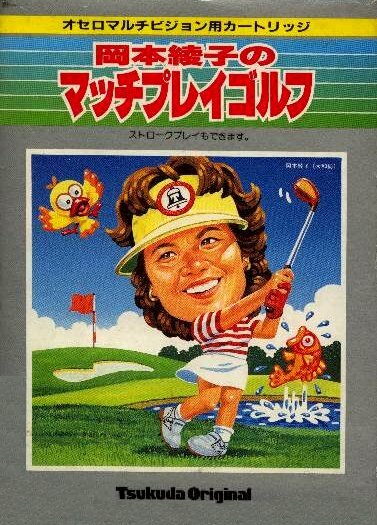 Okamoto Ayako no Match Play Golf pits you against the legendary female golfer in – you guessed it – match play (or stroke play, if you’re a wuss). 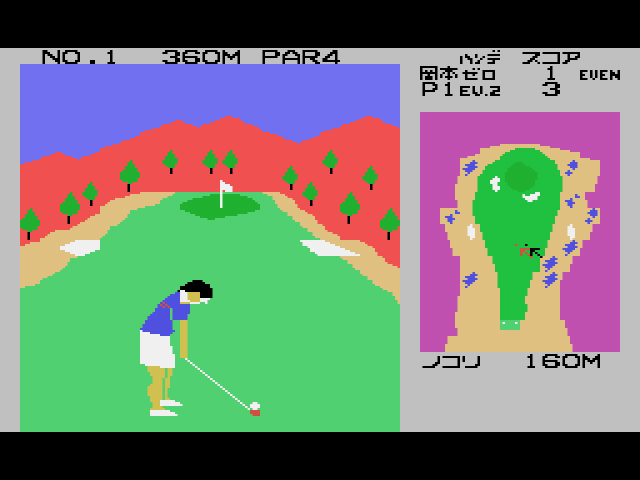 Unlike Sega’s broken Champion Golf, Match Play Golf seems like it’d be a decent golf game if one could understand how to swing properly. The swing meter has a mind of its own, depending on which club you choose. Sometimes the meter won’t move at all prior to your swing, other times the meter will shift violently to the opposite end, ruining your form. Of course, Okamoto understands how to swing properly. You don’t win sixty-two tournaments in a lifetime without busting a few unruly swing meters. Like an Action 52 reject. Surely this is more garbage slime than game. Like Tsukuda Original’s Space Mountain, Space Armor blazes unforeseen trails of terrible in the shoot-em-up genre. 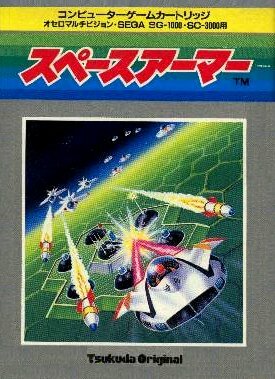 Ostensibly a Xevious clone where one attack is air-based and the other attack is ground-based, Space Armor barely functions under its own limited power. The sound effects interrupt the repetitive droning music. 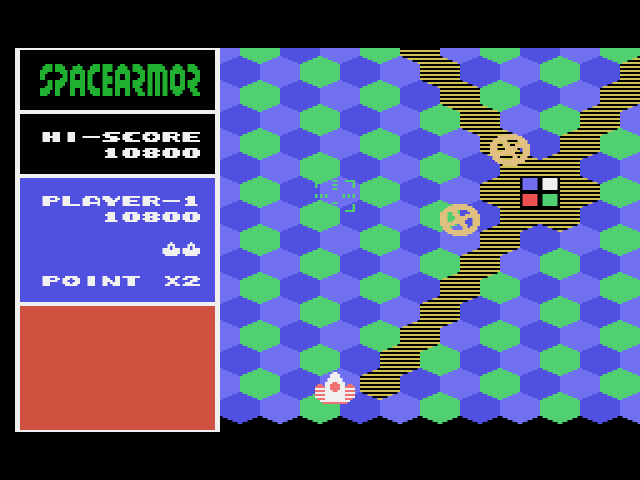 The graphics are a mixture of black space and poorly rendered hexagons. The vertical scrolling is the slowest I’ve ever witnessed in a shoot-em-up. And there’s no pause feature. Space Armor might not be challenging, but the production reeks with a pitiful self-loathing, as if the game can’t even bear to acknowledge its own existence. I hate Space Armor and so should you. Connery looks pretty dap and dry for being submerged in the ocean. Watch out for the diamonds in the sky. They’re kinda forever, you know? 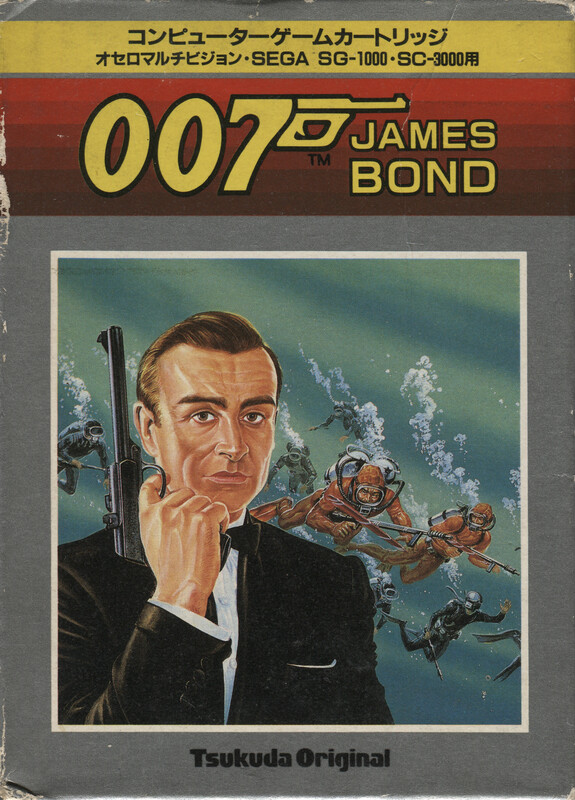 007 James Bond is a port of the 1983 Parker Brothers’ game of the same name, which might explain why the game is so much better than every other Tsukuda Original title. Control James Bond in a shape-shifting boat/car and navigate through scenes from “Diamonds Are Forever,” “For Your Eyes Only,” “The Spy Who Loved Me,” and “Moonraker.” Whether traveling by boat or car, Bond has the ability to fire shots upwards at aggressive helicopters and satellites, or fire missiles downwards at underwater agents, water mines, and angry sea urchins. 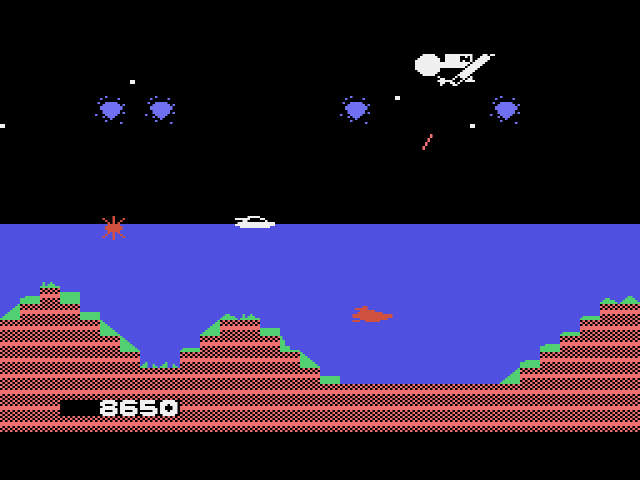 Though both vehicles have slightly different mechanics, 007‘s pitch-perfect controls will navigate you seamlessly through a steady barrage of air, sea, and land attacks. Like all the great Bond films, each level is filled with over-the-top setpieces and consistently thrilling action. All that’s missing are the silhouettes of naked women with bouffant hairdos. All games were published and developed by Tsukuda Original in 1984. Dear God. An F minus? I think this is the first time in my many years of review reading that I’ve actually seen someone use that grade. Surely such an abomination of programing cannot have been created?! Because, if this is true, then the future looks bleak for humanity. Although 007 James Bond seems pretty good, so there’s that.